This graceful little Church of Ireland Chapel is considered to be a gem of Architecture. It is built of cut limestone with double lines of red sandstone around the walls and has lancet windows of Portland stone. 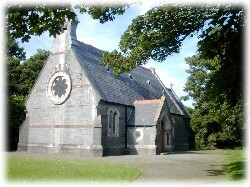 It was built and endowed by Sir Roger Palmer of Kenure Estate and consecrated on 4th December 1866 as Kenure Church. It remains as a chapel without a parochial district as parochial responsibilities were attached to the office of the Chaplain.